Let’s just start out being completely honest here. This lovely blackberry tart was supposed to have a cream infused with Rose Geranium leaves. I spent a ridiculous amount of time calling around to find such a plant. I started with greenhouses and nurseries, moved on to specialty food stores, a bee farmer who makes flavored honey and also soaps, then on to fellow bakers who pointed me in the direction of a tea house. Most people had no idea what the plant was, and even after I described it and let them know that I needed it for baking that very day, I received many suggestions to order seeds online. I didn’t have that kind of time! Every failed attempt made me want to keep searching even more. Someone in Kalamazoo had to have a secret little potted rose geranium plant sitting on some window sill somewhere. Right?! With more sleuthing (which means more Google searches), I decided to call around to some Middle Eastern restaurants and grocers. I felt like I was onto something here. NO. LUCK. The recipe did suggest using rosewater as an alternative, but it felt like the easy way out. 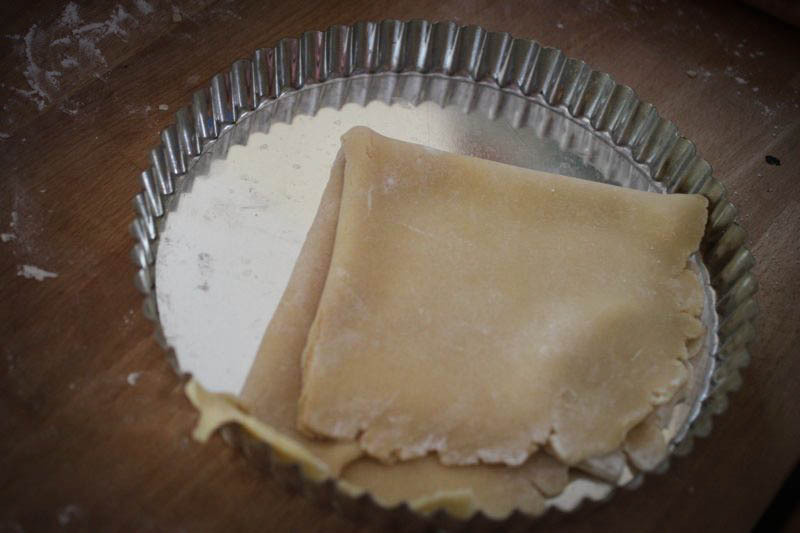 Like many a tart I’ve made before, the process for this tart was pretty simple. 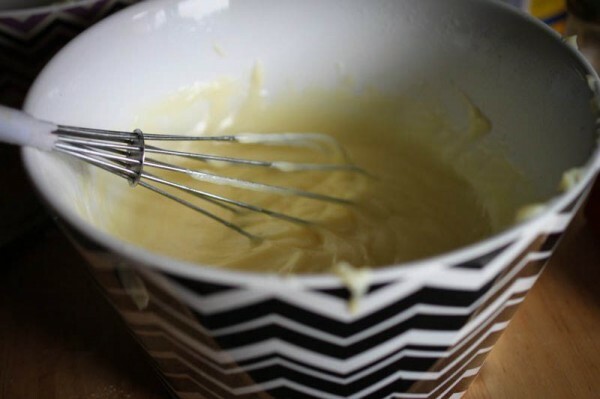 Whipping up sweet tart dough and pastry cream has become second nature. This go round, it involved folding whipped cream and rosewater into the pastry cream. 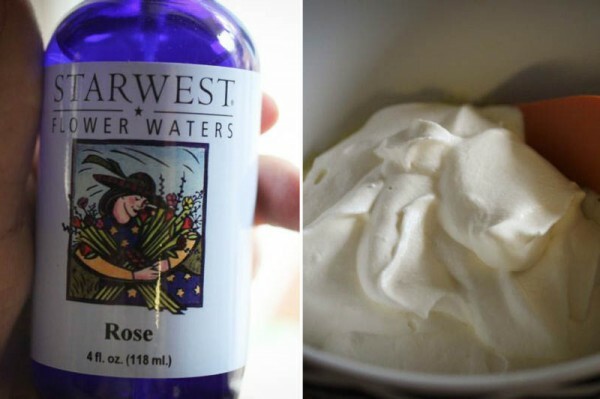 (I bet that lady on the rosewater bottle would know where I could find rose geranium leaves…) Since I now have a bottle of rosewater, I’m excited to look up some uses for the stuff. It smells amazing. Here’s a little behind the scenes tidbit: I was excited to wear a skirt I recently thrifted for these photos. It’s a lovely high-waisted tea length skirt, covered in roses. I was all set to take photos of me holding the tart, and realized Dan and Jack were gone and no one could take my photo. Off went the skirt, and it became a lovely tablecloth. 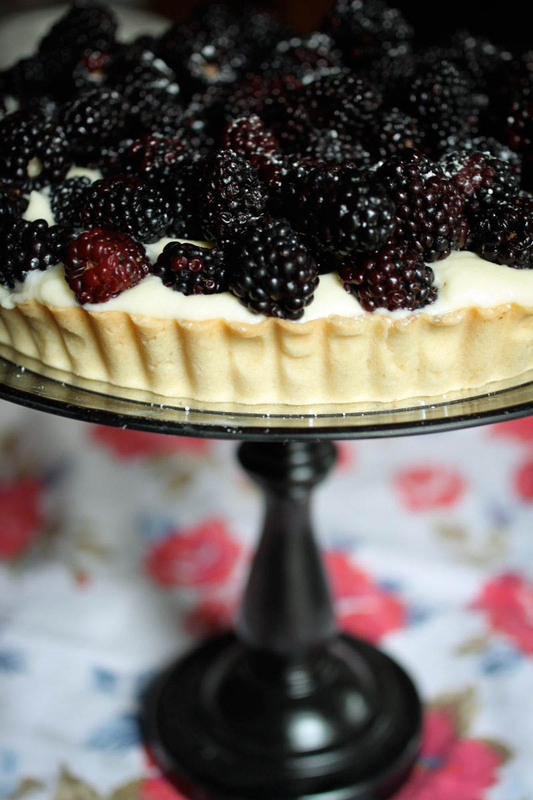 After picking through and finding the ripest blackberries in the bunch, I topped off the tart with a tiny dusting of confectioners’ sugar. The ripe berries and the rosewater are such a nice pair. With nearly every bite, it’s difficult to not think of how amazing it would have been with those dumb rose geranium leaves though. Some day I will find that elusive plant. I feel like that crazy explorer guy from the movie UP – you know the one with all the dogs hunting for that bird and people think he’s nuts and he made up the bird? That’s how I feel! THE BIRD EXISTS AND SO DOES THIS PLANT! Okay, enough of all that. 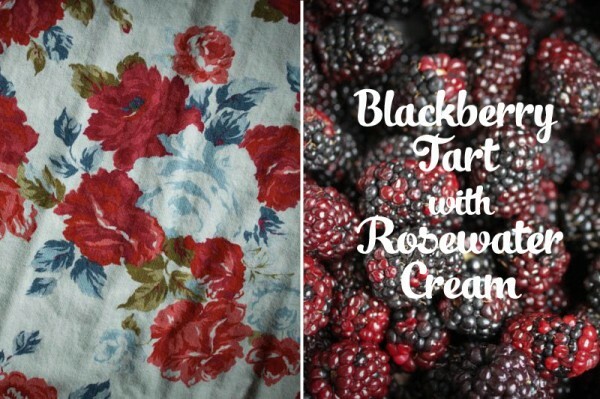 This tart is delicious, and rosewater is lovely. 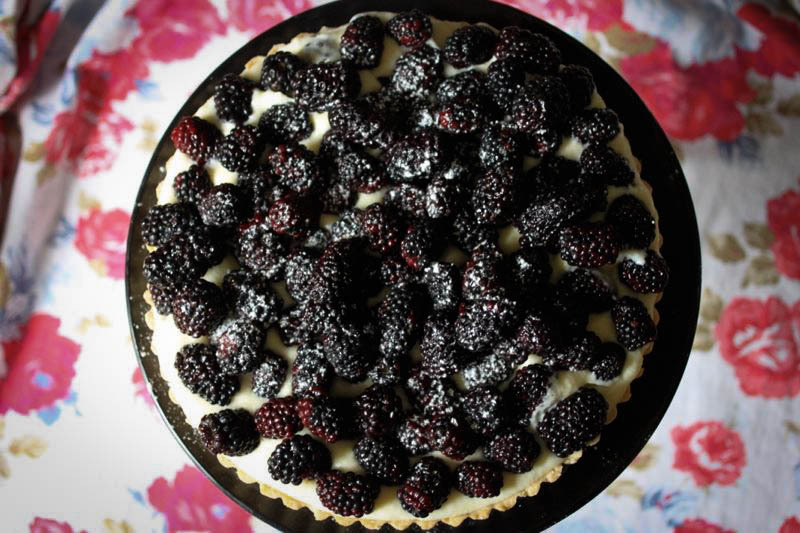 It’s quite the sensory experience, eating this tart. 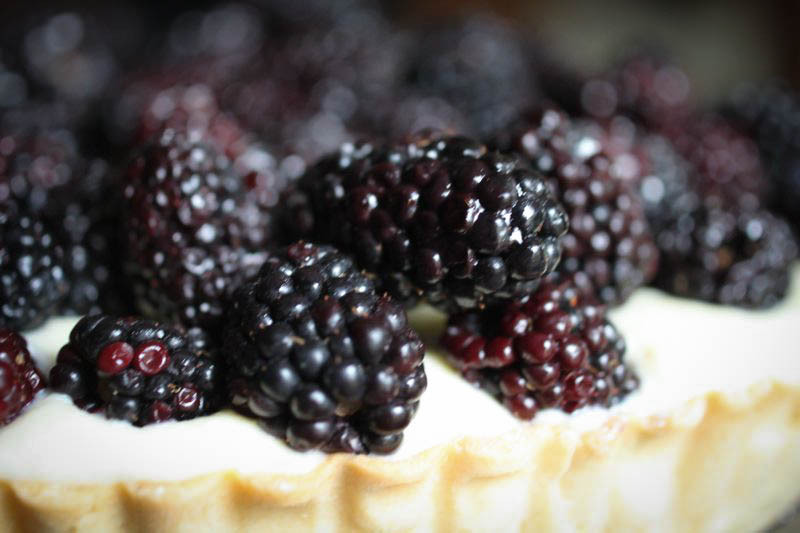 Even on a gray, drizzly day like we’ve been having enjoying this tart fills you up with summer. p.s. This is the last day to enter to win the Tartine Bread cookbook! It’s so lovely, worth the few moments it takes to leave a comment!